During the 1980’s, on behalf of the Vietnam Veterans of America, Chapter 154, I used to visit the local high schools and speak to the twelfth grade history classes about my experiences in Vietnam. Our visit usually began with a slide show synchronized to Billy Joel’s song, Goodnight Saigon. Fellow chapter members contributed personal pictures for the carousel to support this educational venture. After all, most history books and classes taught very little about the war and how it affected mostly the “Baby Boomer” generation. This was just one way of getting the word out. These teenage students were in awe during the presentation, they stared at the screen – faces exhibited a mix of emotions. There was no stirring in the room; the students sat transfixed by the images before them and remained extremely attentive during the one hour we were there. When informed that the soldiers in the slide show were only a year older than they were, the students all looked to one-another in disbelief. Heads began to shake negatively, and comments like, “no way, not this kid!” turned into a chorus. Video games had not yet been invented, so this was new territory for them. It was difficult for them to fathom that food, water, clothing and personal hygiene functions were not readily available in the jungle. In the food department, all meals consisted of canned c-rations; your menu and amount of food depended upon how much you wanted to carry on your back. Doesn’t sound like much, but try going to the supermarket and collecting a dozen various sized cans of spaghetti, veggies, fruit and meat. Weight meant everything in the bush and having to carry any more than what was needed was senseless; average weight of a filled rucksack was sixty-five pounds. Why add more? It’s the same for water – you have what you carry. 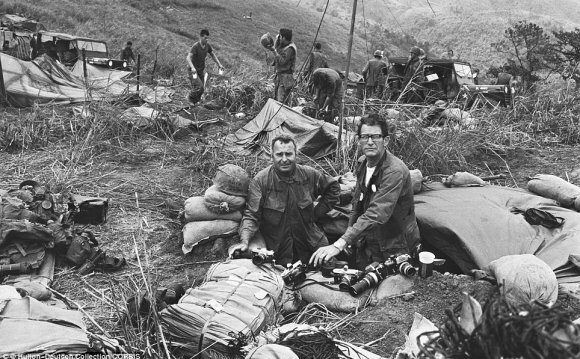 During the dry season, water sources were not readily available and each soldier had to carry a minimum of six one-quart canteens just to get him through to the next resupply – three to four days later. So, without water, the ability to take care of personal hygiene needs such as washing your face, hands, hair or feet was a rare occurrence. During the monsoon season, it rained daily for months, and water was plentiful. Bomb craters would fill with water and were sources for both drinking water and bathing; not in the same one. Canteens filled from these craters must be treated first with iodine tablets to kill parasites and other “swimming stuff” before it could be consumed. The water was murky colored and had a slight smell, but after thirty minutes, it was supposedly safe for drinking. There really wasn’t a choice. Packets of Kool Aide always helped to camouflage the metallic taste when iodine was used. The jungle fatigues worn by the soldiers were lightweight and designed to dry quickly. However, during these humps through the jungle, fatigues were usually soaked with sweat, ripped by thorny vines, worn by repeated sitting and crawling on the ground and were never available in your size. Extra clothing came out on the resupply every three to four days, but only enough for usually half of the men. As a result, only the worst cases got replacements. Everyone else had to wait until the next resupply. It was not uncommon for us to wear the same fatigues for three weeks or longer. By that time, most are a whitish color from evaporating sweat, stiff and brown from dried mud, and torn throughout. The standing joke was that once removed, the trousers could stand on their own accord. Returning to the firebase after a month in the jungle was well received by everyone – except those who were on the firebase. They gave us a wide berth and tried to stay as far away from us as possible. The stench of the returning warriors was unbearable to those greeting them at the gate. Many of us laughed because we didn’t notice anything different in the way we smelled, however, we were quick to notice a clean and sterile, soapy smell as we entered the compound. It’s weird but true. Food, water and clothes were in abundance at the firebase – everyonecould now eat, drink and shower to as much as they chose. This short visit only lasts for three days. Then, it was time to leave on another month-long jungle adventure. These are the simple things in life that most people take for granted. Have you ever had to go a day or two without food or water because you didn’t pack enough? What about the need to wear the same clothing continuously for a couple of weeks or more? How about not being able to bathe or wash up for weeks at a time? It is difficult to imagine living like this, but to the young soldiers in the Vietnam jungles, this was a way of life. Unfortunately, these conditions contributed to a malady of skin diseases such as boils, ringworm, jungle rot, severe rashes and infected cuts and lesions. Nobody was spared. It was not pretty! The school asked us to return the following year and informed us that they were going to expand it to the entire high school student body. That was great news! If you enjoyed this article and want to learn more about the Vietnam War – subscribe to this blog and get each new post delivered to your email or feed reader. A directory to the right of each article, lists my published posts in chronological – links are live – click and read. If you’d rather sample every post by scrolling through the many pages, then click on the Cherries title at the top of this page and be redirected to the blog’s main page…most recent posts are first – a navigation bar at the bottom helps move between pages. "Your Time Has Come" is the second single by the American hard rock band Audioslave from their second album Out of Exile. It was released in 2005. The song is featured on the Soundtrack of the game FlatOut 2.